It’s definitely TOO HOT FOUR HULA here in Hawaii this month. So to help you suffer through whatever crazy weather you’ve been having lately, Amazon is offering the Kindle edition of TOO HOT FOUR HULA to readers for only $1.99 for the month of July only. What better way to kick back than by reading another hysterical mystery featuring the Hula Maidens of the North Shore Kauai as they take a trip to Oahu and get into barrels of trouble once again? So what have I been doing to stay cool? Ha. Writing. And writing. And editing. And finishing up my next book in the Tiki Goddess Mystery series. Be on the look out for HAWAII FIVE UH OH! to be available soon. I’m also planning some You Tube surprises so stay tuned. There are so many fun things going on here in Hawaii that I can’t wait to share with you. 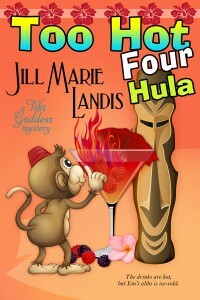 So spread the word, pick up your $1.99 Kindle edition of TOO HOT FOUR HULA and have a great July! When will tiki goddess #5 be out for nook and or nook?